If you wait to sign up for an Ironman triathlon until after you complete a half-Ironman, the extra distance may dissuade you from ever completing an Ironman. Most people who've completed short triathlons take their experience from the short triathlon and then imagine scaling that up to the 140.6 miles of an Iron-distance triathlon. An Ironman is 4.4 times as long as the 32 miles (51.5 km) Olympic distance and twice as long as a half-Ironman. It's too easy for triathletes who completed a 70.3 mile half-Ironman to take that race experience and imagine that an Ironman must be twice as painful -- or even worse. Before I completed a marathon, the thought of biking 112 miles and then running a marathon seemed crazy. The Ironman distance was invented during the exercise boom in the 70s to settle the debate of which athletes - swimmers, cyclists or runners - were the fittest by combining the three existing long-distance events on the Hawaiian Island of Oahu: the 2.4 mile Waikiki Roughwater Swim, the 115 mile Around-Oahu Bike Race and the 26.2 mile Honolulu Marathon. 140.6 miles is a really long journey - it's like driving from Los Angeles Airport through San Diego to the Mexican border - except MPG is measured in Gatorade and Gu as you swim, bike and run to the finish. An Ironman is definitely harder than shorter races and requires tolerance of pain or discomfort over a longer time, but for most amateur athletes it is a mistake to assume that it is equivalent to adding the pain of a marathon to that of a century bike ride and endurance swim. Standalone marathons are very painful because the heart and cardiovascular system are operating at the maximum effort that can be sustained over 26.2 miles of running. It's running a car engine at the red line on a tachometer, but for 3 hours. Slowing down by even a little dramatically reduces the discomfort. A half-Ironman is short enough that the run is often performed at standalone marathon pace. That gives the false impression that the marathon at the end of a full Ironman will be similar in pain to that of a standalone marathon. For all amateur athletes toeing the start line of their first full Ironman, the goal should be to finish, not be first overall or in their age group. Pacing is slower than for a half-Ironman, and experience racing a half-Ironman can even be counter-productive if it encourages too fast a pace on a full Ironman. If you have the fitness to complete a half-Ironman, then you definitely have the fitness to complete a full Ironman at a slower pace. The course is open for 17 hours so you could walk most of the marathon and still get a medal. When I signed up for the full Ironman in Coeur d'Alene, Idaho, I had finished two full marathons but only an Olympic-length triathlon. 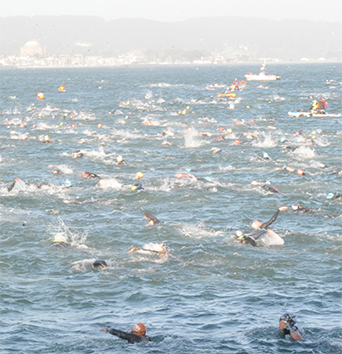 I got a spot in the 2016 Escape from Alcatraz triathlon, and swimming 1.5 miles in the murky water of San Francisco Bay seemed more frightening than 2.4 miles in a clear lake. (A shark had just killed a seal off Alcatraz, so the lake was definitely safer.) 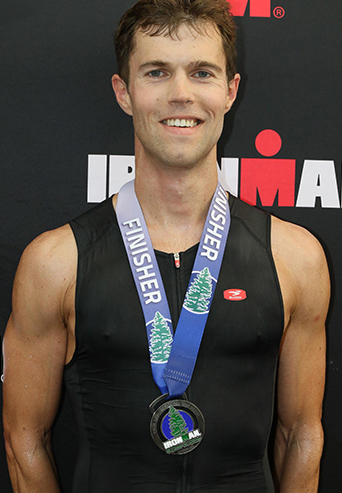 I needed to focus on improving my swimming technique for Escape from Alcatraz, so I decided to build on that with a full Ironman two months later. Colleagues at Strava who had finished Iron-distance triathlons described how they took a relaxed approach to their Ironman pacing and ended up enjoying the experience more than for shorter races where they had an aggressive time goal. While I did sign up for a half-Ironman as a training race, I got pneumonia just before it and had to skip the race. That illness limited my ability to train (especially for swimming) but it encouraged me to go at a slower pace during the Ironman even when I felt like I could go faster. Despite heat up to 95F and smoke from a wildfire, the moderate pacing strategy paid off and I finished with less discomfort than during standalone marathon races before and after the Ironman. If you've completed a half-Ironman or are thinking of tackling that distance, don't be scared off by a full Ironman. With the proper pacing and training, you can do it. And finishing an Ironman will be worth all of the effort and expense.